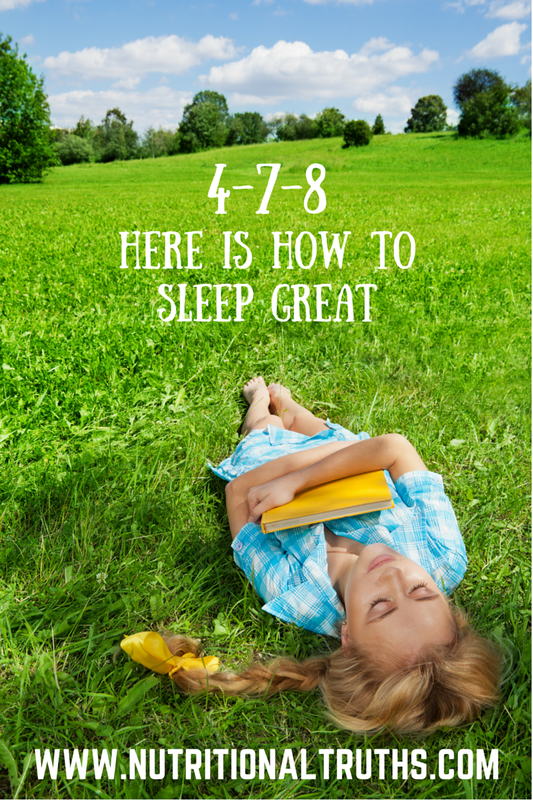 Four, Seven, Eight, read this blog to Sleep Great! Sleep has been proven as a truly important part of our overall health and longevity. A recent study found that people who sleep less than 7 hours a night had an increased risk of death at 21% for women and 26% for men. If sleep medications are used, those risks jump up to 31% for men and 39% for women. Eight uninterrupted hours should be the goal when sleeping. In my book Nutritional Truths I speak to avoiding electronic anything, at least, an hour before sleeping to allow the mind to “wind-down” and begin preparing to rest. As we sleep, our bodies focus on repairing and regenerating our bodies cells. When we fail to allow this process to take places a myriad of ills may befall us. Lucky for me I have almost always been the type who after my head hits the pillow I am asleep within three minutes with few exceptions. I know many have issues falling asleep and after learning a trick that Dr. Weil has shared I will share it with you here, and I have had it confirmed that it does indeed work very well. The exercise is known as the 4-7-8 technique, and Dr. Weil calls it a “natural tranquilizer for the nervous system.” Outside of sleeping the good doctor recommends this exercise to help you lower stress. Try it for yourself and see how well it relaxes you. 1. Place the tip of your tongue against the tissue on the roof of your mouth directly behind your upper front teeth and hold it there throughout the process. 2. Fully exhale through only your mouth while making a whoosh sound. 3. Close your mouth and inhale fully through only your nose to a mental count of four. 5. Exhale fully through your mouth creating whoosh sound to a mental count of eight. 6. Completing one full breath, now inhale and repeat the cycle up to three more times. I look forward to hearing how it works for you! It’s suggested that one does no more than seven cycles in a row. Most often after only a couple of cycles, you will wake up realizing that it worked well for you and smile knowing that access to sleep is now just a few breaths away! Nutritional Truths blog is coming up on our one-year anniversary and with that is another giveaway! There will be several audio copies of Nutritional Truths given away, and it will be super easy to enter. More information later this month, enjoy your weekend and new sleep technique. Share this with everyone and Be Well!